It's almost worth rerouting your trip via Tokyo Station to eat at this noodle shop. 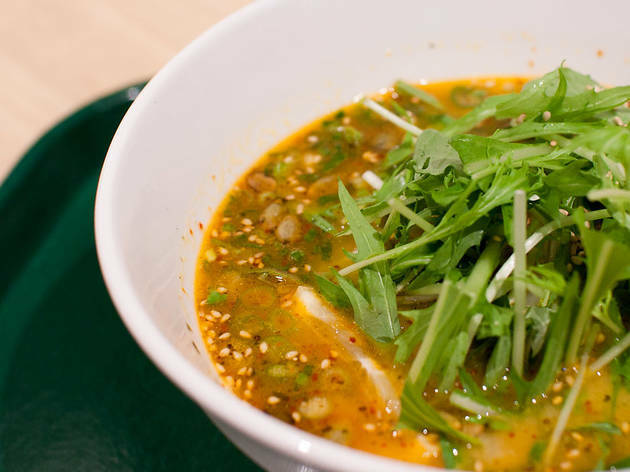 T's Tantan, an offshoot of Jiyugaoka eatery T's Restaurant, earns the rare distinction of being one of the few, and first places selling vegetarian/vegan ramen in Tokyo – or, at least, ramen that's actually worthy of the name. 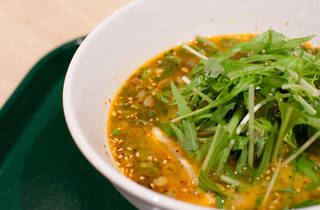 The speciality of the house is Chinese-style dandanmen, served in a broth flavoured with sesame and peanut oil and available with a range of toppings. The menu has expanded massively since they opened almost seven years ago, but their staples remain the same. Our medium-spiced 'midori tantan', topped with leafy greens, soymeat mince and pumpkin seeds (nice touch, that) wasn't as rich as the meat-based version of the dish, but made for a hearty lunch nonetheless. For the non-spicy version, have the white, black or 'gold' (it comes with peanuts) sesame dandan noodles, all of which have a creamy enough finish to trick you into thinking there were animals involved in the process. Add a side of soy karaage if you're feeling particularly peckish. T's Tantan can be found inside JR Tokyo Station, at the end of the Keiyo Street shopping arcade on the way to the Keiyo line platform – note that you'll need to buy a platform ticket to get to the shop unless you're already travelling on JR lines. If coming from outside the station, note that JR Yaesu South is the closest exit to the restaurant.